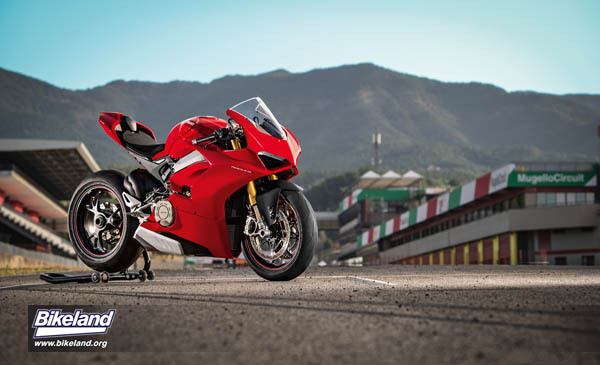 hp/kg, this bike sets a new standard in the supersport production bike segment. dedicated livery, titanium exhaust and machined from solid components. on-track performance and outstanding on-road ridability. 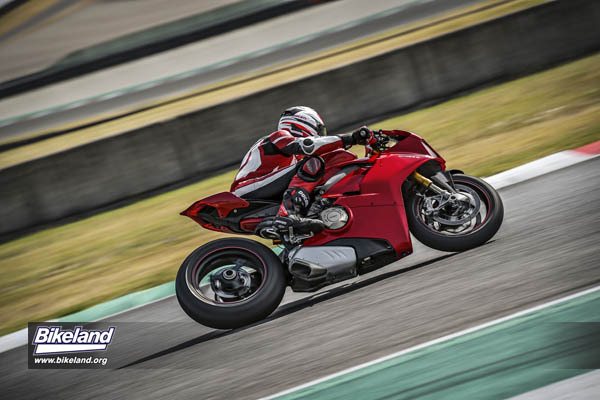 on the straight and ensuring easier out-of-the-corner torque handling. mounting the all-titanium racing exhaust, made by Akrapovič as per Ducati Corse specifications. merge zone: this, together with seat/handlebar/footpeg triangulation, ensures perfect bike-rider integration. 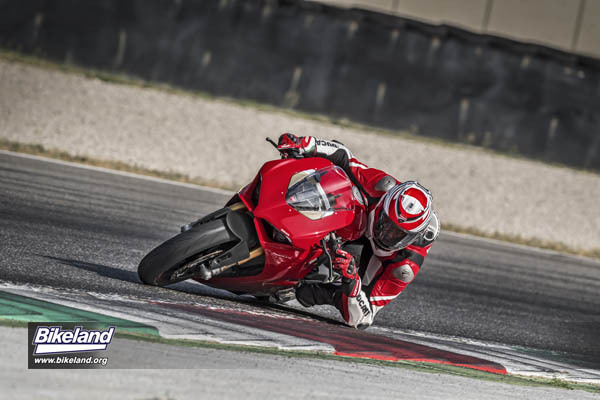 of 1.1 hp/kg, putting the Panigale V4 S at the top of the sport bike segment. 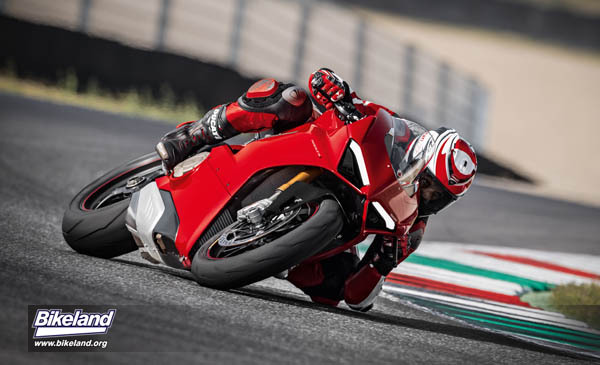 TFT panel that makes the Panigale V4 the highest-tech bike in the category. 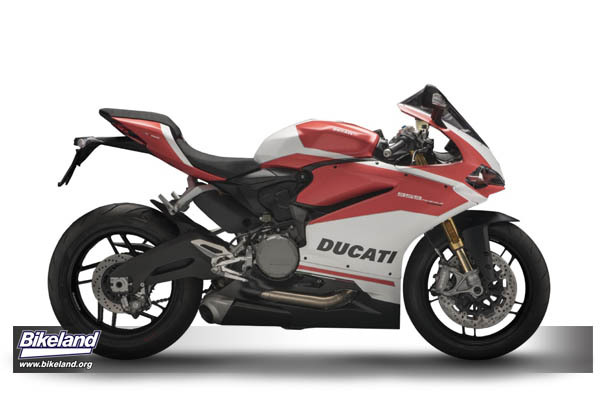 make this Ducati-selected configuration the most technically refined possible. outsize airbox (12.8 litres) that lets the Desmosedici Stradale breathe better. Desmosedici Stradale is designed to be banked rearward 42°, just like the Ducati engines used in MotoGP. bank head. What's more, the crankcase acts as a rear suspension and swingarm attachment point. and gives supreme track performance. 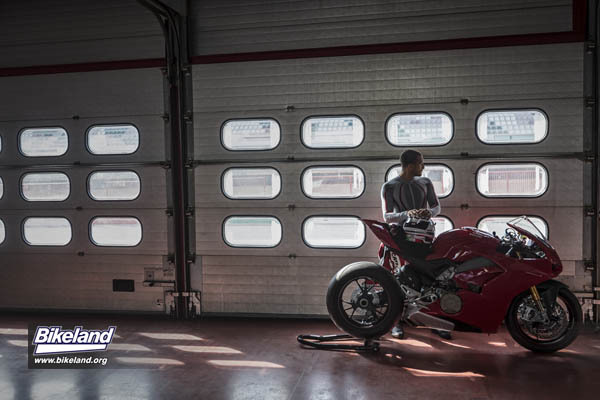 twin, clearly demonstrating the attention to lightness that lies at the heart of every Ducati project. half incorporates the four Nikasil-coated aluminium cylinder liners ensuring wear protection and low friction. forged steel con rods with a centre-to-centre of 101.8 mm. crank pins ground twice over and offset at 70° as on the Desmosedici engines that compete in MotoGP. make the cam covers, the oil sump, the alternator cover and the two-piece clutch cover. benefits stem from two aspects of physics: gyroscopic effect and inertia. that, in turn, improves handling and makes the bike more agile when changing direction. rotating crankshaft has advantages during both acceleration and braking. through the gearbox to the rear wheel so it turns the right way. * The jackshaft adds an extra transmission element to the crankshaft-wheel connection system. This needs to be taken into consideration when establishing crankshaft power if the latter is obtained from measurements made at the wheel. During both homologation and measurement on acceleration test benches it is, therefore, necessary to consider an efficiency or, in any case, an additional coefficient that is, by law, fixed at 0.98.
makes the V4 sound like a MotoGP Desmosedici. engine performance and, therefore, smooth handling, especially on corners and out-of-the-corner stretches. shortens the ducts, optimising the fluid dynamics of the pressure waves that run along the duct itself. fixed lower horn and the engine configuration is characterised by a very short duct. 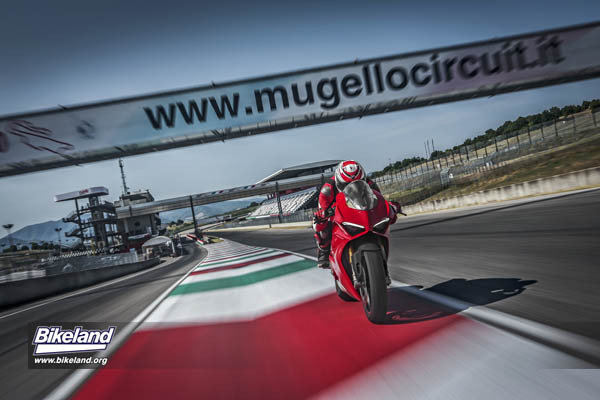 control strategies and modulation of engine 'feel' according to the selected riding mode. plugs - smaller than standard models - also help keep the heads compact. 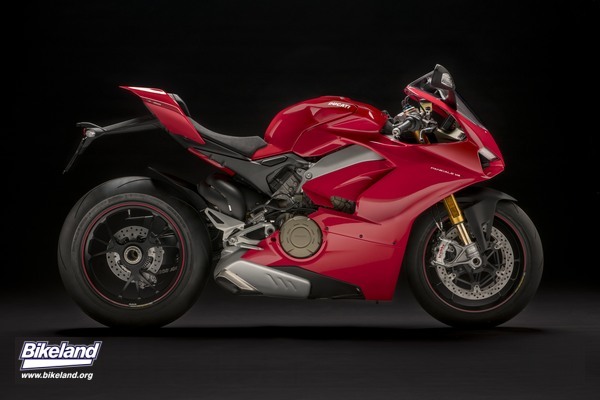 diameter on intakes and 27.5 mm on exhausts, values decidedly on the high side given the 81 mm bore. The valve seats are made of sintered steel. intake and exhaust fluid dynamics to provide higher engine performance. optimises spark advance to prevent any combustion shock. stages that ensure effective lubrication of all moving parts at all times. aerodynamic resistance exerted by the air and splashing of the oil in the con rod casing). just below the water radiator, cools the oil. positioning solution is designed to minimise circuit size, boost efficiency and optimise engine weight. 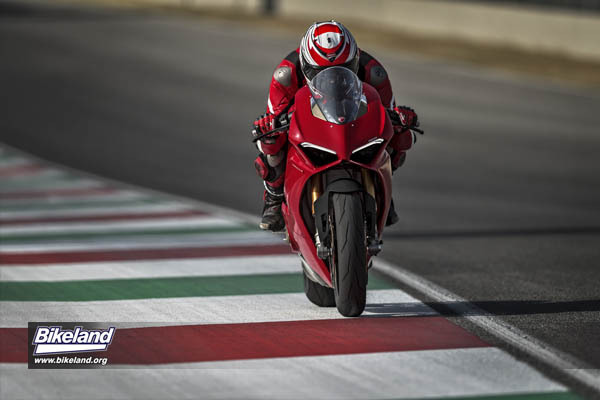 sensor to ensure optimal operation with Ducati Quick Shift (DQS) up & down. shifts are always complete, precise and swift. effort from the rider to release the clutch. remain unchanged at 12 months/12,000 km (7,500 miles). 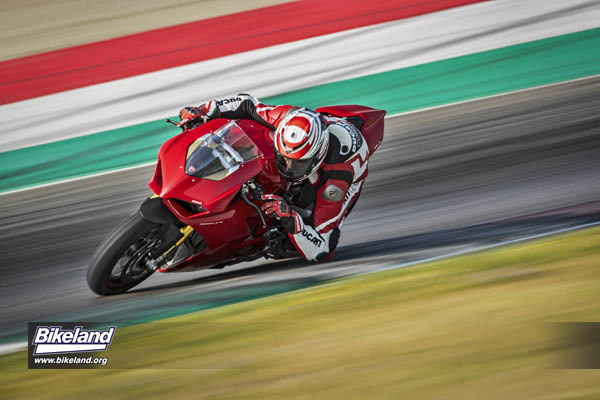 The motorcycle's bodywork develops around the technical parts, and in particular, the new "Front Frame"
modules ensuring low-beam and high-beam functions. approach. The front sub-frame, made of magnesium, is partially exposed to become part of the bodywork. The sub-frame also supports the mirrors with LED turn indicators integrated in the outer shell. easily accessible electrical and electronic components. 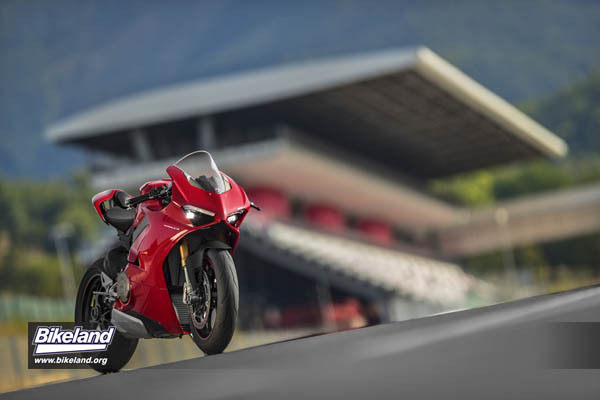 single piece, it features the signature split lighting typical of Ducati racing models. impossible to achieve these values by using a traditional perimeter frame. For this reason, a "Front Frame"
evolution of the monocoque design and was developed on the strength of the experience gained in MotoGP. 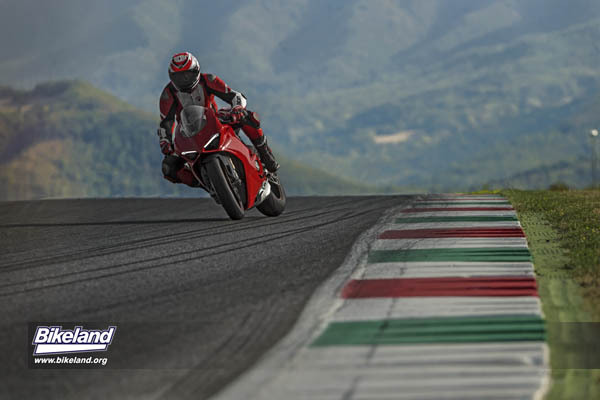 riding precision - ensuring easier control and less fatigue for the Panigale V4 rider. acting as a fixing point for the rear suspension and a fulcrum point for the single-sided swingarm. motorcycle design - especially in the rider seat area. cylinder head at the bottom. performance riding out of corners. Sachs shock, fixed at one end to the Desmosedici Stradale through a forged aluminium element. featuring, among other things, the new Objective Based Tuning Interface (OBTi). 3-spoke forged aluminium alloy wheels. widths designed to provide adequate support for stronger side thrusts. latest evolution of the already high-performance M50. have been introduced in terms of internal ventilation to ensure higher efficiency. translates into excellent fingertip feel, a shorter brake lever travel and prompt response. supported by the ABS Cornering EVO system, which uses the extra-lightweight 9.1MP Bosch control unit. 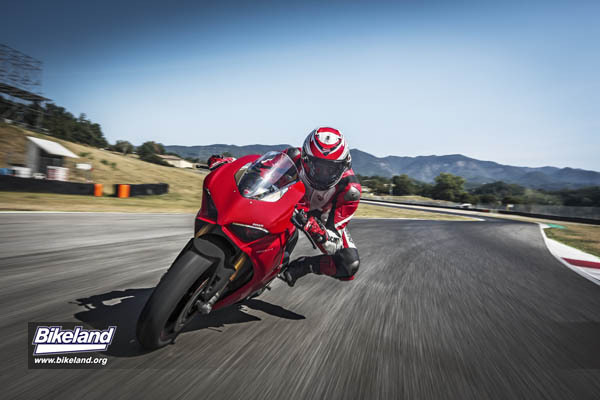 battery, which in the Panigale V4 S and Panigale V4 Speciale versions is a lithium-ion pack. motorcycle's roll, yaw and pitch angles in space. when riding into and out of corners. buttons provided on the left-hand switchgear. even in the most critical low-grip situations. levels 2 and 1, the hard-braking options, are more suited to higher grip surfaces and track racing. extremely hard braking into corner and to help rectify any rider mistakes. ensure suitable rear wheelspin (according to the DTC EVO level setting). With simpler types of traction control, detection of rear wheelspin sees the system kick in to hold it in check. when the grip level changes - i.e. in case of rear tyre wear. motorcycle for everyone, providing improved assistance under extreme riding conditions. engine response and system intervention. via the direct access buttons on the left-hand switchgear. The DSC setting is always shown on the display. 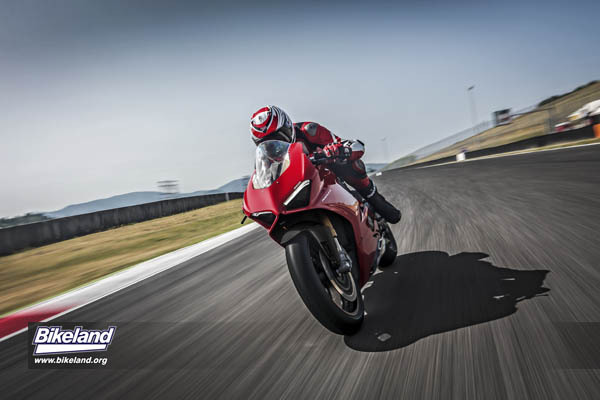 The Panigale V4 also comes equipped with the latest version of Ducati Wheelie Control EVO (DWC EVO). control them with a higher level of precision - ensuring a more accurate response to rider input. starts. The number of available starts resets itself when the rider uses the motorcycle normally. handlebar. Level 1 favours high-performance starts, level 3 is safer and more stable. downshifts - ensured by the full Ride-by-Wire system management. and the Engine Brake Control (EBC). levels integrated in the Riding Modes. fully closed, for the suspension, and 10 for the shock absorber) - and automatic ("Dynamic"). and track lap time efficiency. 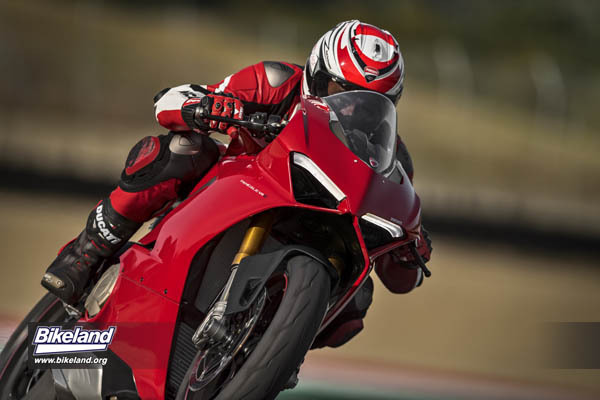 later restore Ducati's factory settings. wheel to provide maximum braking performance, but with the Cornering feature always active. control function is active and the ABS Cornering function is set to provide maximum cornering performance. 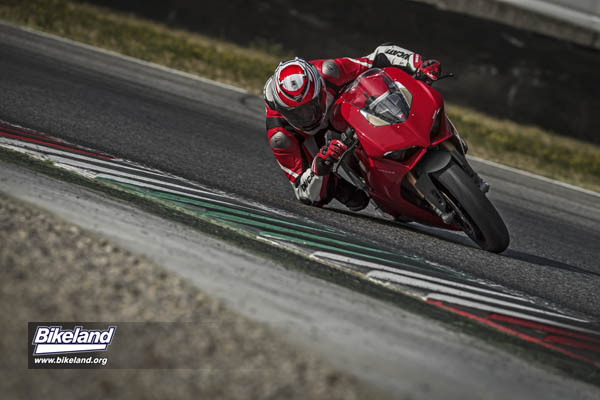 Riding Mode Street - The Street Riding Mode is the one recommended for road use of the Panigale V4. maximum safety, by guaranteeing the best grip and stability. main focus was on readability and easy access to functions. red when approaching the over-rev area. position when the selected lay-out is changed. metres depending on the current speed of the vehicle when the indicator button is actuated). while it is supplied as standard with the Speciale. Corse is ready to race. maintenance intervals. The valve clearance control is in fact every 24,000 km. aluminium for added resistance with the Superquadro engine incorporated as a structural element. and it's sealed off by the bottom of the aluminium fuel tank. steering damper, also by Öhlins. 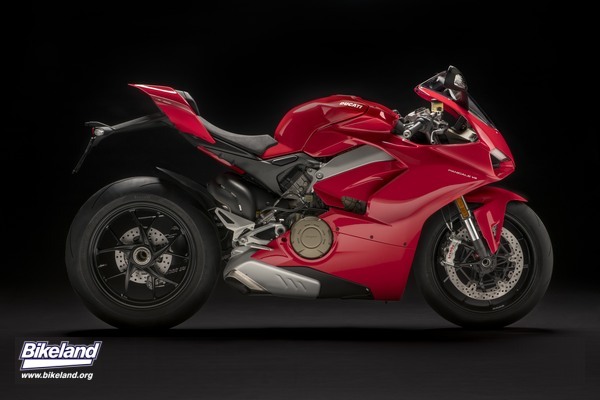 197.5 kg, 2.5 kg less than the 959 Panigale, thanks to the lithium-ion battery and titanium silencer. excellence through the advanced technologies used in its creation. Modes, the Multistrada 1260 brings a whole new level of performance, ease of riding, comfort and fun. the highest torque output in its class at 4,000 rpm, i.e. in the most frequently used rpm range. 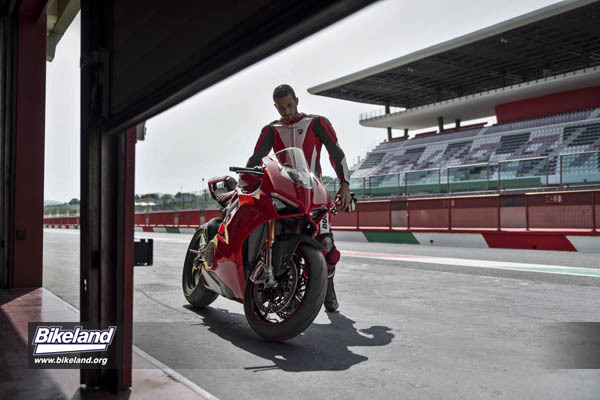 (Ducati Quick Shift) Up & Down which significantly improves the riding experience. 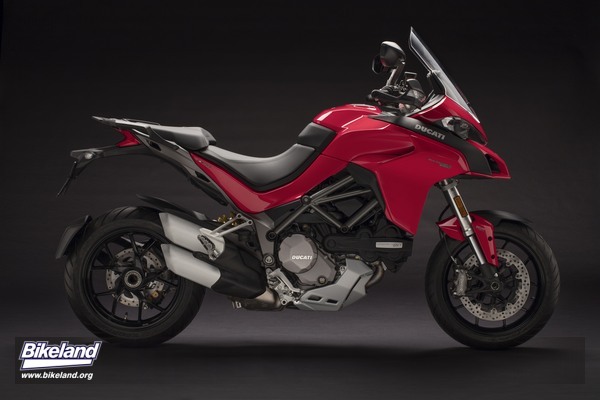 control system featured on the Multistrada 1260 S.
30,000 km, Multistrada owners will be able to enjoy even the longest trips with full peace of mind. current, average and maximum speed and power, fuel consumption and much more. motorcycles and different riding experiences. different Riding Modes, directly from the rider’s smartphone. Also included is an "Alert and Info Service"
information and the ability to contact Dealer directly. offered as an alternative to the plastic panniers (both optional). a new number plate holder and LED rear turn indicators. night mode and black in day mode, Urban mode with grey and Enduro with brown. temperature, travelling time and an icy road surface warning. luggage, rider with passenger or rider with passenger and luggage. The music media player on the TFT dashboard has been improved for when a smartphone is connected. distance left to travel and activated more quickly. activated by an electric actuator. specifications and giving good fuel economy. at 4,000 rpm, i.e. in the most frequently used rpm range. maximum torque to 13.2 kgm at 7,500 rpm. stroke for more accurate engagement. component part is the clutch slave cylinder, with a more compact, integrated design. operate them in one direction (e.g. opening) and another to activate them in the other (closure or return). Corse’s Superbikes and MotoGP bikes. minimises their weight and allows them to be smoothly integrated. levels for maximum security on less-than-perfect city roads. ABS is set to level 3.
functionality is off, and ABS on the rear wheel is disabled. and control rear wheelspin, boosting performance and active safety significantly. maximum prevention of wheelspin. 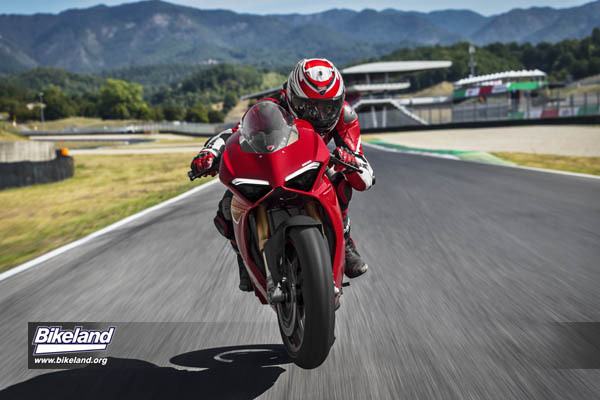 On the Multistrada 1260 DTC is incorporated into the Riding Modes. restore the original factory settings. controls torque and power accordingly to maximise acceleration in safety without destabilising balance. function lets the user restore the original factory settings. oscillation of the sprung mass and significantly increasing comfort and safety. movement in relation to this point. from the Bosch IMU which dynamically reveals the bike's attitude on the two axes (roll and pitch). system provides compromise-free solutions whatever the situation or riding conditions. stability by using four pressure detectors to allocate braking power optimally between front and rear. being applied only at the front. competition: 330 mm discs at the front coupled with Brembo M50 monobloc radial 4-piston callipers. 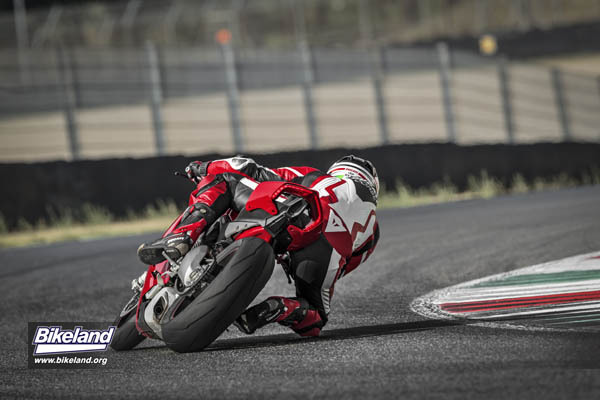 brake pressure during starts, leaving the rider free to focus on throttle and clutch control. release pressure on the rear wheel and cease holding the vehicle: pressure reduction is gradual. up at full load with the side panniers. riding comfort even when the bike is fully laden. keep the bike perfectly balanced. 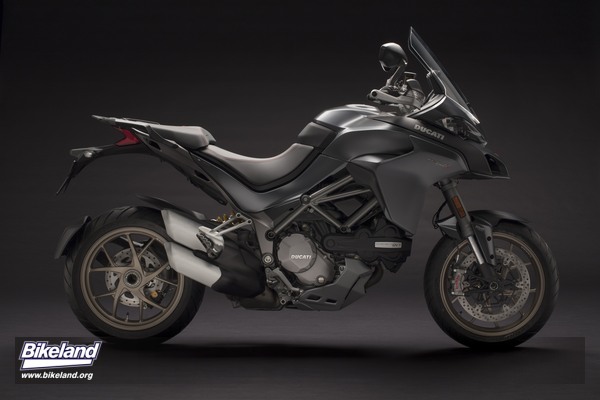 Multistrada 1260 S and D|Air versions. and 190/55-17” on the rear. 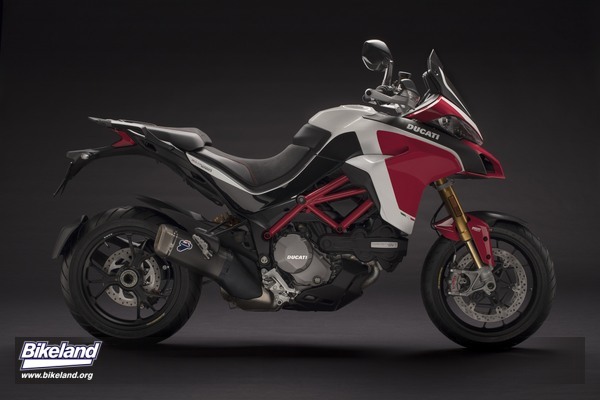 brings out the sports character of the Multistrada 1260.
competition: Ducati has already won it three times. shock, which can both be adjusted mechanically. most frequently used rev range. dashboard, which has been renewed both in terms of graphics and logic. sump guard, a broader kickstand base and off-road footpegs).